Attending a garden party at Buckingham Palace, 29 May, repeating her Emilia Wickstead dress from the sovereigns' jubilee lunch and adding a Jane Corbett hat. a) At the Thames River Pageant, 3 June, in b) Alexander McQueen with a Lock & Co. hat. 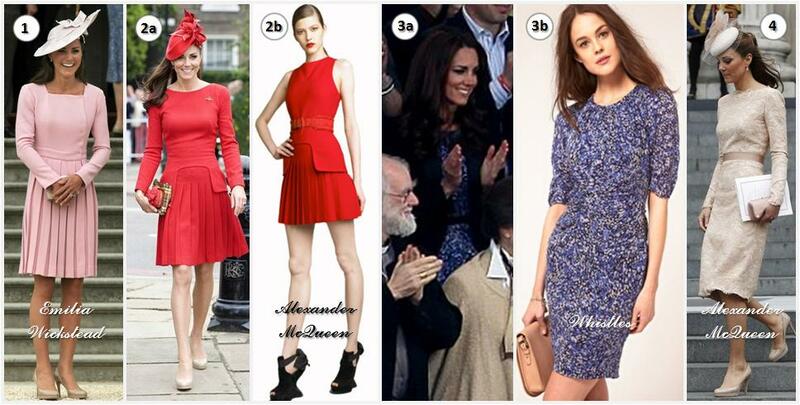 a) Attending the Diamond Jubilee Concert, 4 June, in b) a Whistles dress with a McQueen jacket. The Jubilee Thanksgiving Service, 5 June, in McQueen again with a Jane Taylor hat. Much as I loved how she rocked the red at the Thames pageant, this final elegant turn is my favorite jubilee appearance from Kate. Which one did you like best?